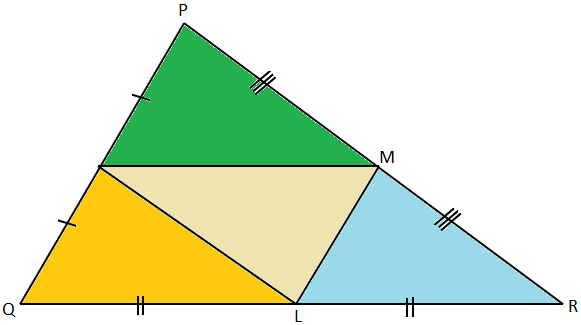 Here we will show that the three line segments which join the middle points of the sides of a triangle, divide it into four triangles which are congruent to one another. Given: In ∆PQR, L, M and N are the midpoints of QR, RP and PQ respectively. 1. N is the midpoint of PQ. 2. By the Midpoint Theorem. 4. Similarly, PM = NL. 6. Therefore, ∆PMN ≅ LNM. 6. By SSS criterion of congruency. 7. Similarly, ∆NQL ≅ LNM. 8. Also, ∆MLR ≅ LNM. 9. From statements 6, 7 and 8.